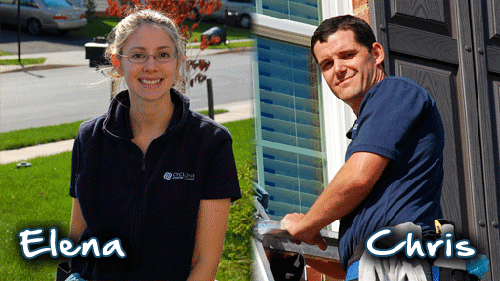 What is the difference between Cyclone Cleaning Services and other Frederick window cleaning companies? What is your "FREE, Easy, Same-Day e-Quote'? If it rains, can you still clean my windows? Will they be ruined afterward? Do I have to move my furniture or blinds before you come? Will you get my floors wet or dirty? How often should I have my windows professionally cleaned? Who is Cyclone Cleaning Services? What is a "water-fed pole"? Why shouldn't I just use a maid service to clean my windows? We are the most meticulous and thorough window cleaner in Frederick. Just read our testimonials! 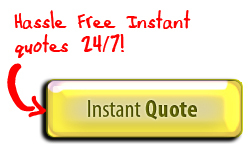 We are the easiest company to deal with, due largely to our unique FREE, Easy, Same-Day e-Quote system. We want to make your life easier. We don't hire laborers to do our work. We, the business owners, personally perform all the work. This way, we can respond to any of your needs immediately, answer any of your questions, and of course make sure that you're delighted with the quality of the work. We have the best equipment and tools in Frederick, being experts in the use of both the traditional "mop and squeegee", but also the latest in pure-water-fed-pole technology. Yes, that might sound boring, but what it translates to is the capacity for us to reach and effectively clean all of your windows, even if they are 50 feet, (approximately 4-5 storys) high! What is your "FREE, Easy, Same-Day e-Quote"? This is our unique system for estimating the price of your window or gutter cleaning project (and also screen repair or hard-water stain-removal). When you simply submit a few basic details, we will be able to figure an estimate remotely, so that there is no need for us to come to your home, and so that you can have a response quickly. The system does have it's limitations, and so occasionally we might inform you that we need to do a free in-person estimate. This is more so the case for West Virginia or Virginia properties. However, while it may not be possible in that case to perform the in-person estimate on the same day, we will still be in contact with you on the same day. There exists no such thing as a "license to clean windows", however we are a registered business with the States of Maryland and West Virginia. $2million of General Liability insurance ($1million per occurrence) through Liberty Mutual, which covers any accidential injury to people, or damage to property which could occur. IMPORTANT: We also have a "Care/Custody/Control" endorsement to cover any injury or damage caused by "willful" action, ie, not just freak accidents like a wind-gust. For example, it covers you if we push too hard on your glass and crack it. This is an important detail which is often overlooked. We also carry commercial auto insurance, in case of accidents on your driveway, or in your parking lot. Bonding, in simple terms, is "insurance against theft". It is usually carried by companies who have employees and want to protect themselves from the case where an employee steals something. Since we have no employees, (and no desire to ruin our business through something as foolish as theft!) we see no need to be bonded. "It was a rainy day and I didn't think the windows would look very good. He assured me they would be fine. My windows are beautiful. It has been a couple of weeks, several storms, and they still look great." 6/6/2012 - Micki F, Martinsburg WV. As long as a storm isn't blowing, we'll generally keep working, and everything will still turn out great. No. We will move or work around any furniture or blinds. We suggest that if you have anything unusually heavy or valuable blocking the window that you let us know. If you can't move these things before we arrive, we will help you to carefully deal with such obstacles. No. We always wear shoe-covers, and use drop-cloths where necessary. From what we have seen in this part of the country, twice-a-year service is a good compromise, and will keep your windows looking very nice year-round. Annual service is suggested as a minimum, but usually by the time the annual service is due the windows have been looking dirty for quite a while. If you want your windows to always look clean, we suggest quarterly cleanings, with every second cleaning being just an exterior clean. We are Chris & Elena Kinny. Chris is originally from Sydney, Australia, and met Elena while traveling in South America in 2005. In 2007 we married in Elena's hometown of Frederick, Maryland. In February 2011 Chris established Cyclone Window Cleaning and set about growing the business. The business was later renamed "Cyclone Cleaning Services, LLC" to better represent the growing list of services being offered. In June 2012 Elena was able to join him, and so Frederick's finest window cleaning service became a two-person team - which has added to our efficiency, versatility, and also safety. It is a pole with scrubbing head and also tubing for delivering pure water to the surface which requires scrubbing. Pure water has been treated with a system of filters, making it 100% clear of minerals, organic material, or any other contaminant. What this means is that it has great cleaning power, and that it also rinses away spot-free. 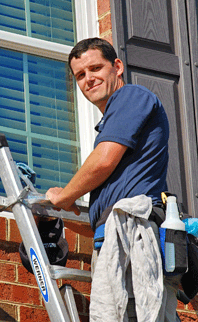 It allows for cleaning of windows that are not able to be cleaned from a ladder, and all from the safety of the ground. Anyone can wash glass, but getting a perfect, streak-free, sparkling result is an art. You've tried to clean your windows before, no doubt, perhaps with Windex and paper towels, and it's almost impossible to get a crystal-clear result without streaks or smears. Maid services generally clean windows this way. Furthermore, we've never seen a maid at the top of a 32 foot ladder cleaning the exteriors! You won't believe how clean and "invisible" your windows can be until you've had them cleaned by a professional like Cyclone Cleaning Services! Want to add yourself to our long and ever-growing list of satisfied customers? Then submit a FREE, Easy, Same-Day e-Quote now, or check out our window cleaning, gutter cleaning, pressure washing, or screen repair pages for more detail! If you still have question, check out our FAQ page, or simply give us a call on 301-305-6229. Talk to you soon!